Yes our clocks have turned back, which means it is a light out in the morning on the way to work. But what about on the way home? It is dark out there and I don't want this to discourage you from training outdoors. I am pleased to say I am teaming up with Nathan Sports to bring you one heck of a run club. They will have a few of their visibility products for you to try to ensure motorists, cyclists, and pedestrians can see you after dark. Starting Tuesday 3rd November and running (see what I did there?) 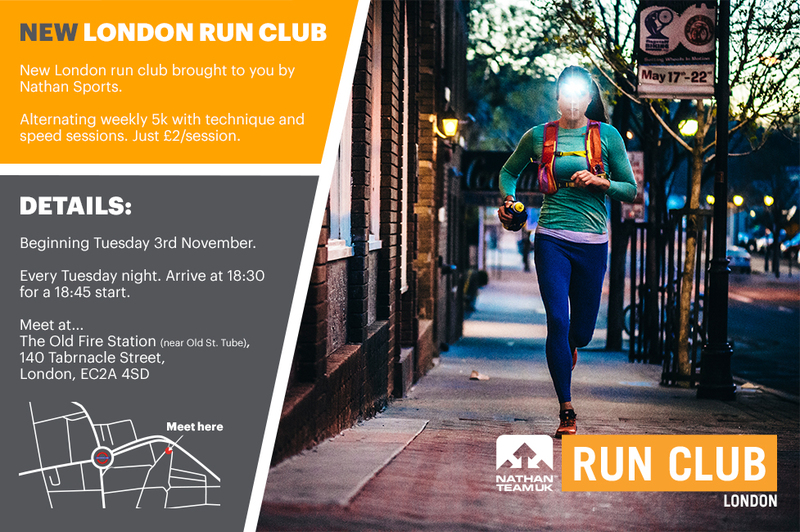 through 15th December, meet me at Action PR's office on Tabernacle Street near Old Street Tube Station for a guided run at 18:30 for 18:45 departure. Week 1 will be a 5K route passed London's landmarks. Even weeks will be technique and speed session in a nearby park. 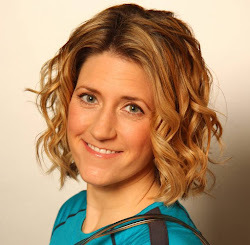 Bags can be left in the office and there is a shower if you have a hot date after the run. Each session is £2 and we will use the money after our final session for pints in the pub. Take a sneak peek at the 5K route by downloading the RunGo App. This handy app gives verbal cues as you run so you won't be distracted by looking at a map on your phone (much safer!). You also won't need to worry about getting lost as the app will guide you back if you take a wrong turn. All abilities welcome as we will have front, middle, and tail runners. No excuses now so bring your running kit to work with you on Tuesdays. Big thanks to Nathan Sports for keeping us active this winter. This is perfect, a colleague has suggested taking part in a charity Xmas 5k run which is on Tuesday 8th December: http://www.brainwave.org.uk/south-east-santa-dash/ so although this will clash with week six it will be good prep. 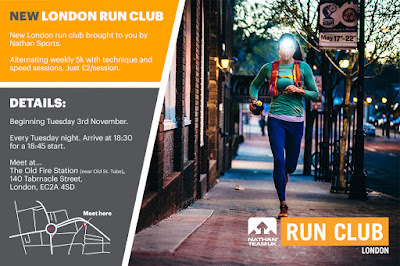 While I'm looking at the calendar, can you confirm if you mean to run on Tuesday evening and therefore the first run will be Tuesday 3rd November (not 2nd). I'll aim for Tuesday 10th as I'm busy next week! Hope your first week goes well!